A casual chat on Whatsapp brought forth an idea and eventually turned to reality. Yes, this is how we ended up at Dario's last night for dinner. I asked a friend who lived in the neighborhood if he had heard of Darios, thinking it was an ice cream place, only to discover it is a pure Vegetarian Italian restaurant. A family outing after long, that too for a meal- why am i making a special mention? Well, it is a rare thing for us as a family to go out to eat. Eating out is reserved for when someone is visiting [one of my uncles ;)], but then last new year we made an exception and went out to lunch at Rajdhani. Gramma wanted to repeat the same, minus a few members, but that dint happen. And finally, I announced "let us go out for dinner" and the rest is the evening..
Tucked away near Ashwini Hospital on Kasturi Rangan road [the road next to Chola], Dario's is a fairly small place. But only when you enter the building do you realise how not so small it is. A house that has been transformed, it is quite cozy and quaint. The walls are all white, with nothing but different funky Mona Lisas staring at you. There is Mona Lisa with Steve Jobs face, Dhoni, Charlie Chaplin, and just about everyone else you can think of. 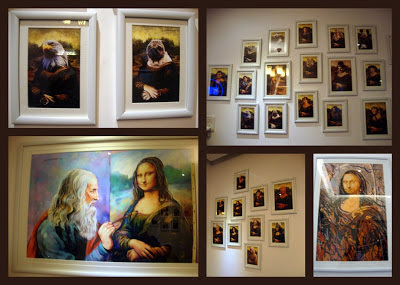 Infact, throguh the decor, Mona lisa with variations adorn the walls. The main hall has a huge mosaic of Mona Lisa, quite colorful and vibrant. CREMA DI SPINACI- Spinach and fresh cheese dip with parmesan, served with warm pita bread- This was quite simple. I actually requested for another cup of the dip they gave with the Focaccia. ARANCINELLE- Sicilian rice balls stuffed with peas and cheese served with pink sauce and red chilli- The rice inside was not your normal rice, it had an interesting taste and we quite liked it. As the conversation flowed, so did the food. We all tasted the other dishes and tried to identify the ingredients. Was fun.. For the main dishes, we decided to order different dishes so we can try different flavours. Dad wanted something light and so opted for the PENNE POMODORO [With classic tomato sauce, basil and cheese along with yellow zucchini & capsicum slices ] which was basic pasta. Granpa wanted pasta, and we ordered PENNE ARRABBIATA [With spicy tomato sauce, red chilli and onion] which he loved, it was spicy and yet not over the top. I wanted to try something diffferent and chose GNOCCHI DO MASSA GNAZIU [Home-made gnocchi with rucola, served with a spicy tomato and cream sauce with fresh rucola and cheese], well it was different from what i had envisioned the gnocchi to taste like but was simple subtle and the sauce was heavenly. I literally licked the plate clean. and mom had her eyes set on CRESPELLE AI FUNGHI [Baked pancakes with mushrooms, garlic, cheese, tomatoes and peas], we actually asked for the one with Asparagus but werent sure since we were told Asparagus soup wasnt available. Thin crepes with filling topped with white sauce, and i am guessing it had been baked wee bit as well. Phew... That was one awesome meal.. 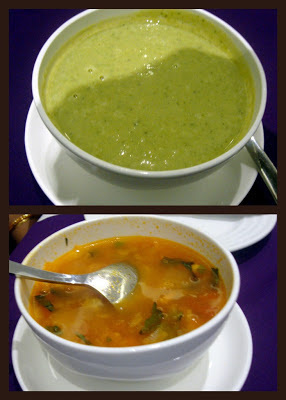 The soups and starters came within 10mins, but the main dishes took over 20mins to arrive on the table. 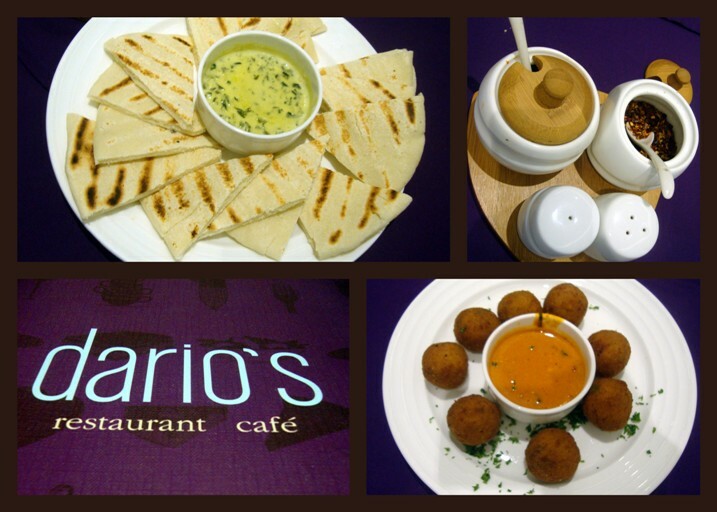 The dishes were all good, portions quite large and flavours distinct in each of the dishes we had ordered. 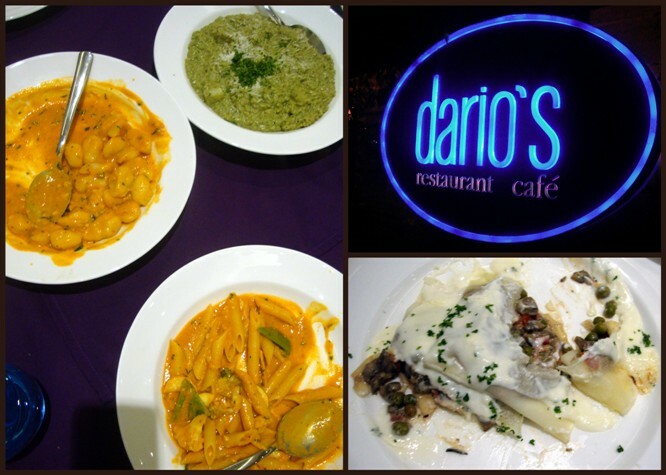 If you are fed up on Eden or Cream center, or for that matter dont mind a good Italian meal, hop into Dario's..